Instead of pre-promoting the thirteenth season of Project Runway, Lifetime used the visibility of their outdoor ad sites to launch their new sci-fi series The Lottery and now that the fashion reality competition it back on our screens in full swing, it looks like they've opted to chase after the Emmy voters, rather than any potential new viewers with their latest promo billboard. But will it be lucky or unlucky season number thirteen for the show, which is starting to show signs of the threads unravelling, with high profile sponsorship partners like L'Oréal no longer involved with the hair and beauty styling and the Red Robin restaurant chain now providing money for the grand prize, it's no longer top tier fashion darlings. Fortunately the two most important ingredients are back though, host and judge Heidi Klum, who's no stranger to showing a bit of skin to help promote the show decked out in a creation of clothes hangers this season and the wise mentor of all the aspiring fashion designers, Tim Gunn, whose 'Make It Work' catchphrase the show wouldn't be the same without. Daily Billboard is a massive fan of the show, but does wonder with spin-offs like Project Runway Allstars and Tim Gunn's new mentoring focused show, Under the Gunn, is this fashion reality show concept becoming spread too thin? Has quantity resulted in a lack of quality and ultimately has the series never been the same since it left Bravo? 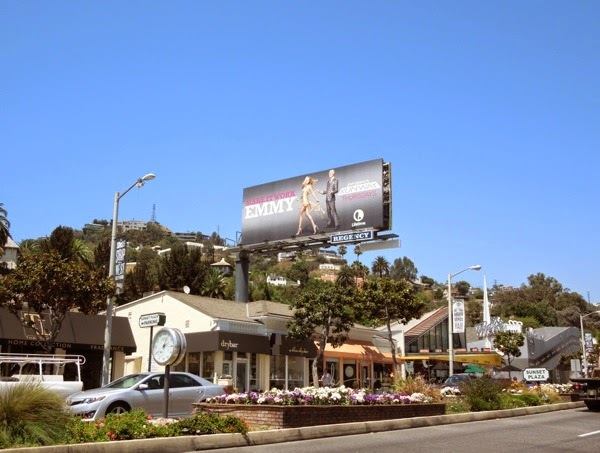 This fashion forward billboard was spied gracing the skies above L.A.'s Sunset Plaza on July 31, 2014, and if you're a fan of the show be sure to check out all these previous season Project Runway billboards. Let's keep everything crossed that the series can recover its former glory and once again win the Emmy for Outstanding Host for a Reality or Reality-Competition Program, like Heidi and Tim shared last year. Make it work people, make it work.